Heat an 8-inch waffle iron; preheat the oven to 200°. Grease the waffle iron with nonstick spray. Spread 2 cups of the tots on it; sprinkle with salt. Close and cook on medium high until nearly crisp, about 5 minutes. Open the waffle iron and fill in any holes in the waffle with more tots, then close and cook until golden and crispy, 2 to 3 minutes. Transfer to a baking sheet; keep warm in the oven. Repeat with the remaining tots. Meanwhile, in a bowl, mix the crème fraîche and mustard. In another bowl, toss the arugula with the lemon juice and olive oil. 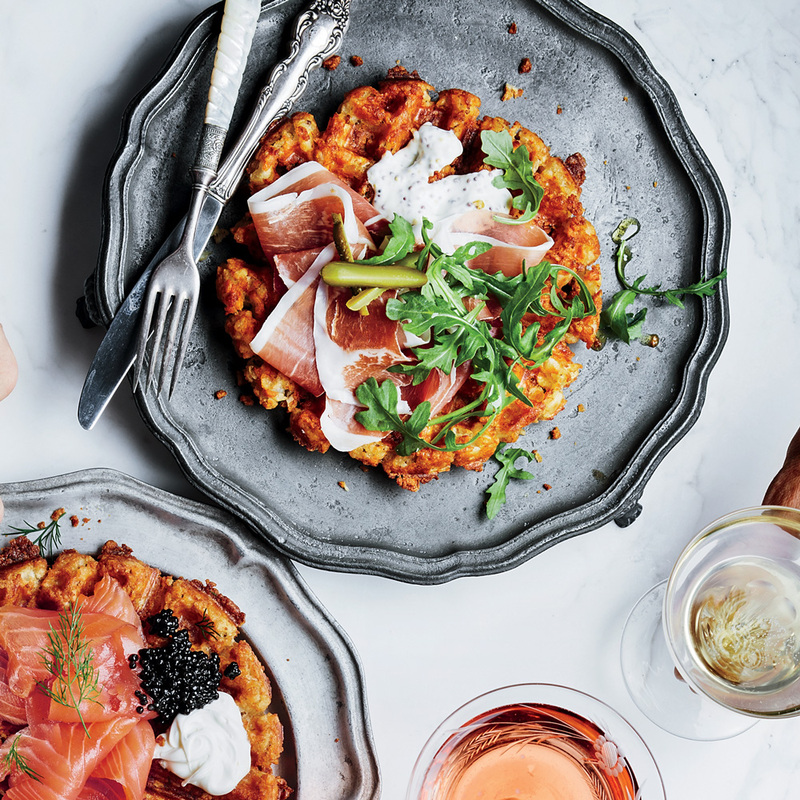 Top each warm waffle with 1 1/2 tablespoons of the mustard crème fraîche, 3 slices of prosciutto and 1/2 cup of the dressed arugula. Garnish with cornichons and serve.